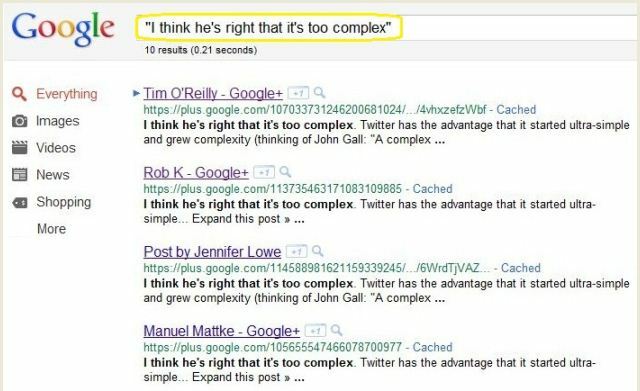 I picked out a phrase from the article to search – “I think he’s right that it’s too complex” and searched for it in Google Web Search – Google does find the O’Reilly article and several other articles that cite it (below), but the entries are just the names of the people who have entered them, with no title words at all — How strange! The title is without a doubt the most important piece of metadata there is. One could further argue that it is the most important part of your web page, period. As a librarian, I sometimes see parallels between the early evolution of the Internet and the early days of books. One of the important milestonetemps for books was the establishment of the Title Page as the place where the title of a book was clearly stated (imagine books without titles). So it’s been interesting to see, over the last 10-15 years of the Internet, that the Web page title has also come to be an indispensable handle for Web pages. Is Google Plus trying to take us back to a world of Web pages without titles? Posted in Google Plus, Metadata, PicsYes, Uncategorized.